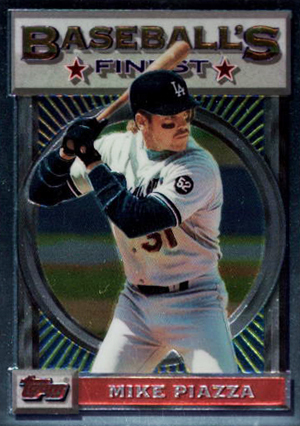 1993 Topps Finest Baseball is one of the most important sets of the 1990s. It introduced the hobby to the chromium base set. It also took the idea of parallel cards to a new level with Refractors. 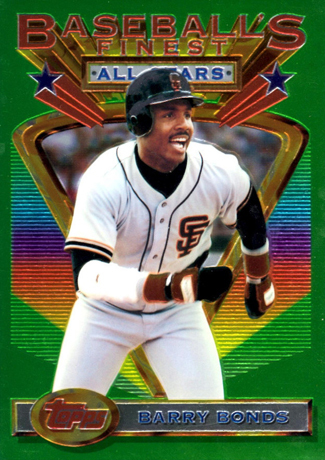 Without 1993 Topps Finest Baseball, we might not have the player rainbows like we have today. The Topps Chrome and Bowman Chrome lines probably wouldn't exist either. The 199-card base set consists mainly of the game's stars from the day. Regular 1993 Topps Finest Baseball cards have a busy design. A player photo is surrounded by a metallic circle in the middle. The top of the card has a bar that reads "Baseball's Finest" and the bottom of the card has a small nameplate with the player's name and Topps logo. Other than the photo, card fronts make no mention of the player's team or position. Cards 84 through 116 on the 1993 Topps Finest Baseball checklist cover All-Stars. Although it's a subset with its own design, All-Star subjects don't appear anywhere else on the base set checklist. These cards have a similar style photo. Instead of a circle, there is a smaller spotlit triangle behind the player that has a pair of stars shooting out of the top. The header reads "Baseball's All-Stars." The nameplate is slightly different as well, but it still only has the player's name and Topps logo. 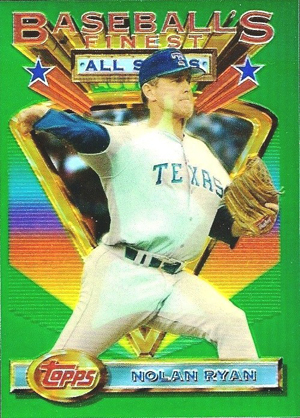 1993 Topps Finest Baseball is primarily a stars-driven set. The checklist has only a pair of rookie cards: J.T. Snow and Mike Lansing. Both players had solid careers but neither made much of a hobby impact. Although the base set remains popular among collectors, the 1993 Topps Finest Baseball Refractors are what really carry the set. A parallel to the base set, they look very similar except for the rainbow reflection they give off. Refractors are inserted approximately two per box. Several 1993 Topps Finest Baseball Refractors command a premium because they are suspected short prints. Although some are superstars, others are not. So if you see a Mickey Tettleton or Glenn Davis offered at a ridiculous amount, there is a reason for it. 1993 Topps Finest boxes come with 18 packs of six cards. Each box also comes with one over-sized Jumbo All-Stars card. These are identical to the base set All-Stars except for their size. Inserted one per box. Over-sized cards measure 4 1/2" x 6". The following is a list of suspected 1993 Topps Finest Baseball Refractor short prints. Short prints apply only to the parallels and not the 1993 Topps Finest base set. great product….tough to locate after all these years and if you find a box/pack..you will pay a nice sum. i just realized that the unopened boxes have different players depicted on the top of them too. Only reason I give it 5 stars, is because I own a bunch of these cards, and had no idea of their value. I did know they are quite scarce, so I never destroyed a single one. Not even dups. Base set is nice looking. But the Finest sets are ugly. Especially compared to 2015 Topps. Hard to go back and look at these monstrosities….